Today we’ve got a golden delicious treat for you: June 6 is National Applesauce Cake Day! Cake has been around for eons, and applesauce dates back to the Middle Ages. But the two never co-mingled until fairly recently: during World War I, when a shady sugar shortage shocked the country. Cooks were urged to display patriotism by substituting applesauce for the sugar that cake recipes called for. The concept wasn’t entirely unheard of; Medieval European fruitcakes sometimes called for fresh or dried apples. Applesauce adds sweet flavor to a cake and makes it impressively moist. The cakes grew in popularity through the 1920s and 30s, before falling off the radar for a while. They were rediscovered in the health-conscious 90s, and seen as a healthier, low-cholesterol and low-fat alternative to a traditional cake. They are typically spiced with cinnamon and nutmeg, and make a perfect autumn treat. Nevertheless, we soldiered on (pun intended) and completed our challenge. 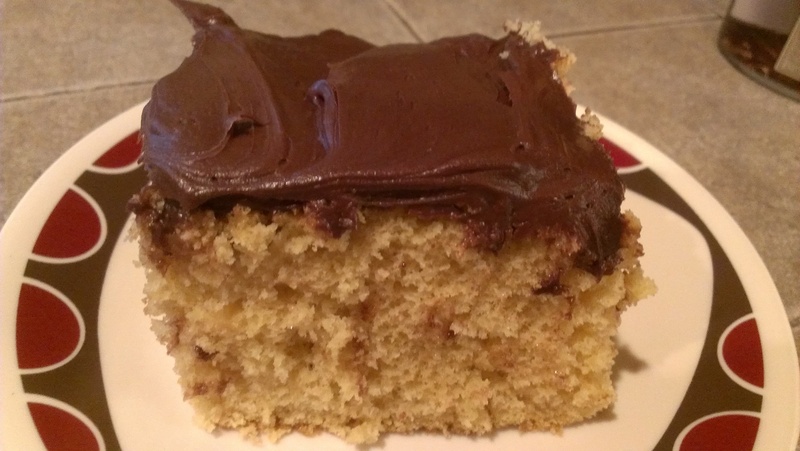 We kept it simple with a yellow Duncan Hines cake mix and chocolate frosting. When you substitute applesauce for oil, you keep a 1:1 ratio, so it was easy enough to switch that out. Oh, and the cool thing is, last fall Tara and I went out to Hood River for bushels of fresh apples, and I made homemade applesauce. That’s what I used in the recipe, so in that sense, the cake is sort of “from scratch” too. And I have to admit, it turned out tasting pretty good! Just a hint of cinnamon-y spice.